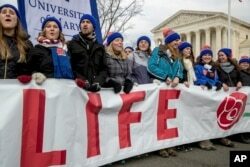 Thousands of people came to Washington to attend the March for Life demonstration on Friday. The yearly gathering protests abortion. An abortion is a medical operation that ends a pregnancy and results in the death of the fetus. The march took place almost one week after about 500,000 people marched in Washington the day after the inauguration of President Donald Trump. Many of those demonstrators called for the protection of reproduction rights. Friday, activists opposed to abortion gathered near the Washington Monument to hear speeches from Vice President Mike Pence and other politicians. 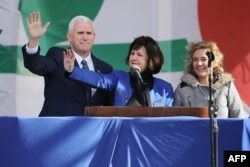 (L-R) U.S. Vice President Mike Pence, his wife Karen Pence and their daughter Charlotte Pence arrive for a rally on the National Mall before the start of the 43rd annual March for Life January 27, 2017 in Washington, DC. Pence told the crowd that “life is winning again in America.” Pence is a longtime opponent of abortion. “Along with you, we will not grow weary, we will not rest until we restore a culture of life in America for ourselves and our posterity," Pence said. Demonstrators have come together for 43 years to protest the Supreme Court decision known as Roe versus Wade. That decision, in 1973, made abortion legal in the United States. Fern Parent came from Greenwood Lake, New York to attend the march on a windy day. She said that she came this year to support the rights of the unborn children. The demonstrators welcomed a recent action by President Trump. Trump does not have a consistent record on the issue of abortion. Currently, the Supreme Court has eight justices instead of nine. The president has said he will nominate a justice who opposes abortion. Trump is expected to announce his choice to fill the high court’s vacancy next week. Anti-abortion activists march past the Supreme Court in Washington, Friday, Jan. 27, 2017, during the annual March for Life. ​Rob Van Rite from Maryland is hopeful that this year’s march will help influence the president to nominate a justice that supports the anti-abortion or pro-life cause. Rite also said that he believed the goal of the march was to have everyone value and share respect for life. In his words, they "want to return to a view where life trumps death." The word “trump” means to be more important than something else. It is also the last name of the U.S. president. This story was originally written for VOANews.com by Katherine Gypson. Phil Dierking adapted this story for Learning English using other media. Mario Ritter was the editor. abortion – n. a medical operation that ends a pregnancy and results in the death of the fetus.